These five fun tennis footwork drills will improve your agility. They’re taken from Complete Conditioning for Tennis and suitable for all ages and abilities. Improve your game with top tennis coaching books by experts. To be able to play tennis at a high level, you must develop the ability to move quickly in all directions, change directions often, stop and start, all while maintaining balance and control to hit the ball effectively. Tennis truly is a sport of continual emergencies; with every shot your opponent hits, the ball can travel at a different velocity with a different type or amount of spin and can land in a different part of the court. Therefore, speed, agility and quickness (i.e., proper footwork) is crucial to good movement and positioning on the court. Although you should always work on grooving your strokes, don’t overlook the importance of working on your movement on the court. Your footwork and movement, just like your tennis strokes, can be improved—if you work at it. Practice these five tennis footwork drills and you’ll fly across the court. All the videos were developed by expert authors Mark Kovacs, Paul Roetert and Todd Ellenbecker along with the United States Tennis Association (USTA). This game is great fun, especially for children. You will improve your movement, agility, footwork and reaction time. This game is played with two or more players. Players only use the service boxes. Play and score the game like a tiebreaker. Instead of a racket and tennis ball, use a Z-ball (reaction ball). Catch and toss the ball underhand. Using underhand throws, play tennis with your partner by tossing the Z-ball into your opponent’s service box. The ball must bounce once in the service box before it is caught. The ball must be caught before it bounces a second time. Play until one player wins a tiebreak game to 7. If more than two players are involved, play the game using table tennis rules; players alternate in one at a time. To make the drill easier, instead of a Z-ball use a tennis ball. To give it more of a conditioning focus it can be adapted with a medicine ball. The spider run is tennis’ version of the shuttle run. Of all the physical fitness tests administered to players, the movement patterns in this test most closely simulate the actual movements during a tennis match. The stopping and starting actions of this activity make it an excellent test as well as a great training drill. Using masking tape, mark off a 12- by 18-inch (30- by 46-cm) rectangle behind the centre of the baseline, using the baseline as one of the sides. Position five tennis balls on the court—one on each corner where the baseline and singles sideline meet, one on each side where the singles sideline (S-line) and service line meet and one ball on the centre T.
Start with one foot in the rectangle. Retrieve each ball and place it in the rectangle, one at a time, moving in a counterclockwise direction. Have a partner record your time with a stopwatch. As soon as the last ball is placed in the rectangle, the stopwatch is stopped. Anything under 15 seconds is considered excellent. An average score for a male would be between 15.00 – 15.30, women on average are around 3 seconds slower. 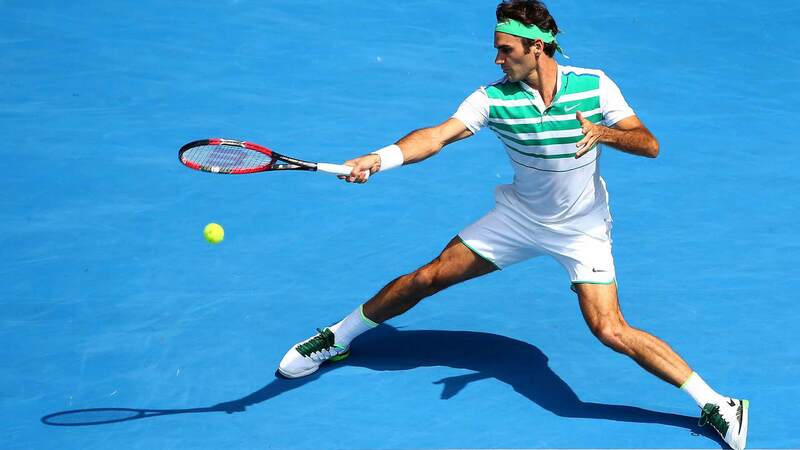 In tennis, you have to continuously move your feet to ensure you are in the correct position to return the ball. This drill will help you improve your footwork and lateral movement. Line up 10 to 12 cones along the baseline about a yard (0.9 m) apart. Start at one end of the cones, facing the cones (across the width of the court). Weave through the cones using small sideways adjustment steps, moving forward slightly diagonally until you reach the end of the cones. Backpedal through the cones to the starting position and repeat. This is excellent for agility and general conditioning. It is a great exercise for players who prefer to stay at the baseline and are often drawn into long rallies. As there is quite a lot to remember it is not recommended for really young children. Start at the doubles sideline, facing the net. Shuffle (sidestep) to the centre service line. Sprint back to the starting position. Turn and sprint across the court to the opposite doubles sideline. Shuffle back to the centerline. Sprint back to the doubles sideline. Turn and sprint back to the starting position; you should start and finish at the same spot. Perform two or three repetitions with 30 seconds of rest between each repetition. After performing steps 1 through 4, instead of immediately performing steps 5 through 8, stop and walk back to the starting position and repeat the sequence. Variation – Perform the drill with a racket in your hand. Hold the racket in the dominant hand as if you were playing a point. The hexagon test is a high-performance fitness test. It measures foot quickness when changing direction backwards, forward and sideways while facing one direction. Facing the same direction during the test simulates facing your opponent during a match. The hexagon test also tests your ability to stabilise the body quickly between those changes of direction, because the body needs to be stable before the next jump can be performed. If the body is not stable, you will lose your balance, which will hinder your time. Use masking tape to create a hexagon on the ground. Each side should be 24 inches (61 cm) long. Stand in the middle of the hexagon and remain facing in the same direction throughout the test. When your partner gives you the command “Ready, go,” begin jumping forward over the tape and immediately back into the hexagon. Your partner will time you with a stopwatch. Continuing to face forward, jump over the next side and back to the middle. Repeat for each side. Continue this pattern by jumping over all six sides and back to the middle each time for three full revolutions of the hexagon. When the feet enter the hexagon after three full revolutions, your partner should stop the stopwatch and record your time. Give yourself one practice trial. Test yourself twice, recording both times with the stopwatch, then make a note of your best time. Aim for under 12 seconds, that would be classed as an excellent score. 13 seconds would be average, anything over 13.5 seconds needs improvement according to Kovacs. Juniors are generally half a second quicker than adults. We’d love to hear how you got on with these tennis footwork drills. So why not leave us a comment to let us know? And don’t forget, for even more fantastic tennis footwork drills be sure to check out Complete Conditioning for Tennis. If you liked this post, you may also want to check out Why do female tennis players grunt? and Free tennis lessons for 20,000 children across the UK.